Universal coupler lock fits virtually all 1-7/8", 2", and 2-5/16" trailer couplers. Bright red finish discourages thief's from messing with your trailer. Resists rust and corrosion. Simple installation and removal. Advanced locking mechanism resists picking and prying. We can NOT key two (2) of these locks the same. The similar 379KA coupler locks are available keyed alike. The only difference between this one (389DAT) and the 379KA is the color. 1/2" and 5/8" HITCH PIN LOCK SET RECOMMENDED FOR - all 1-1/4", 2 inch trailer hitch and 2-1/2" trailer receiver lock . 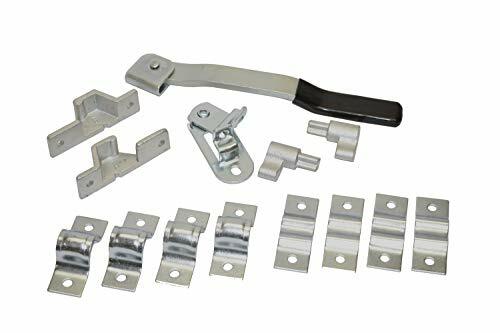 Trailer Lock Set with Extended shaft of 3-1/2" also fits Toyota Tundra, Ford F-150/F-250/F-350, GMC/Chevy 2500/3500 and Dodge trucks with heavy-duty tow packages. TOW HITCH LOCK with INNOVATIVE DESIGN - Extra Safety Clip & Hole in each hitch lock pin for towing when locking system is lost or damaged. Locking pin for trailer hitch with 5 silicone O-rings for a perfect fit. 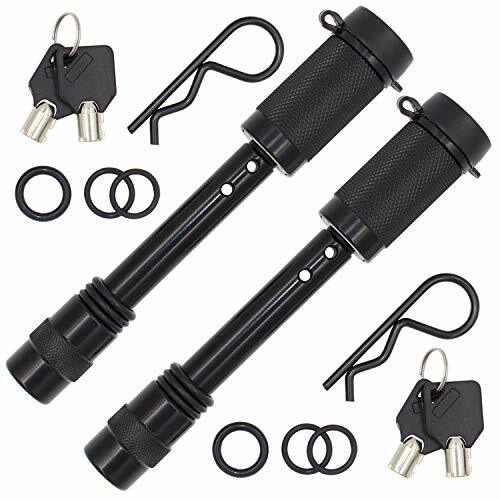 Extra-long hitch receiver lock pins work with all class I, II, III, IV, V receivers. EASY TO USE LOCKABLE HITCH PIN - locking hitch pin for 2 inch receivers & more made easy to install with Push-to-lock technology. Equally easy to unlock hitch locking pin with just 1/4 key turn system. The C-Lock has an industry-standard 5/8" diameter that's designed to fit almost all Class I, II, III, and IV trailer hitches. Locking down your trailer is as easy as sliding the pin into place; a heavy duty lock keeps it from accidentally sliding out as well as deterring theft. A protective cap also keeps out water and grime, weatherproofing the locking hitch pin for years of reliable, rust-free use in any environment. Two duplicate keys are included for added convenience. In comparison to the competition, the C-Lock serves more hitches and comes in at a fraction of the price, not to mention it also includes a manufacturers 1-year warranty. VERSATILE: Built to fit most industry standard 5/8 hitch receiver. QUICK AND EASY: Easy Installation No drilling or mounting required; just slide in the pin, lock it, and go! 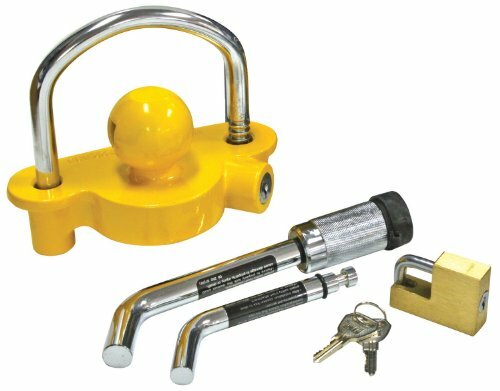 Reese Towpower Tow 'N Store Lock Kit is designed to provide excellent towing. It fits two inch hitch receivers and is lockable offering extra safety. This kit includes swiveling clip which enables to replace cotter pins. 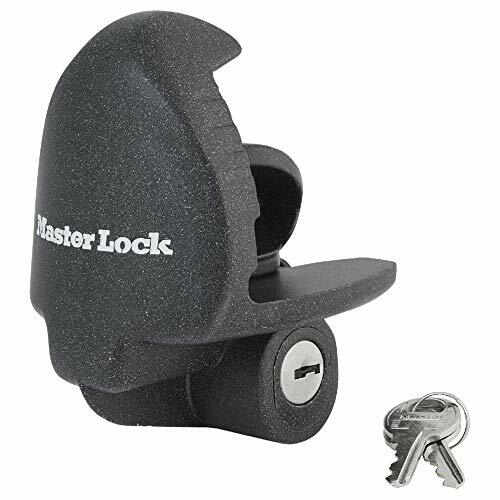 The Master Lock 377KA Trailer Hitch Lock features a trailer coupler lock, designed to fit 1-7/8 in. (48mm), 2 in. (51mm) and most 2-5/16 in. (59mm) trailer couplers. The advanced locking mechanism provides resistance to picking and prying. The Limited Lifetime Warranty provides peace of mind from a brand you know and can trust. 8). Before purchase, please verify all dimensions of your hitch, to get a great fit of the hitch lock pin. Converts Receiver into Concealed Vault The durable, all-metal HitchSafe converts your receiver into a vault. The hitch pins are secured inside receiver via 2 sliding bars that can only be accessed with a 4-dial combination drawer that offers 10,000 different combinations. 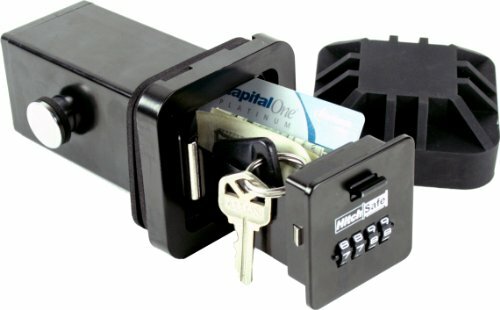 The HitchSafe can secure keys, license, cash and credit cards. It s great for active lifestyles where need to be stored. The HitchSafe eliminates the hassle of carrying or losing keys/cards. The combination drawer is concealed/protected with an attractive dust cover. Great for Outdoor Activities where Keys are a Hassle or can Become Lost HitchSafe can store spare keys for quick and secure access. It can also be utilized for sharing access with friends/family or special situations such as outdoor sports where carrying keys can be problematic and credit cards/cash left inside vehicle would otherwise run risk of being stolen. Secure, Concealed Key Storage that will Not Fall off like Magnetic Key Holders Far superior solution to magnetic key holders that eventually fall off (they are never there when you need them!). If your magnetic key holder has not joined millions of them lying on roadside, you then have an open invitation for someone to steal your car because everyone knows where they are hidden. HitchSafe is contained within solid steel structure of hitch receiver via a combination where only you can access keys when needed. 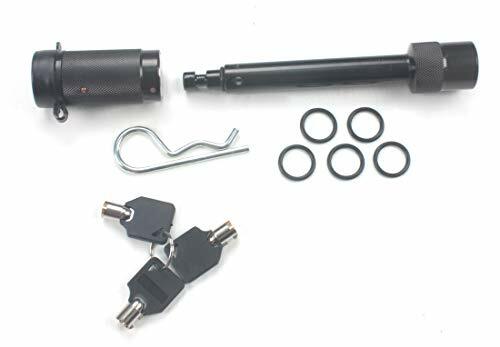 Includes: 1 adjustment pin and 1 receiver pin for 2-1/2 inches receivers. Adjustment pin: 4-3/8 inches by 5/8 inches inside shank; receiver pin: 3-1/3 inches by 5/8 inches inside shank. Warranty: One Year Mfr. Warranty from date of purchase. The Master Lock No. 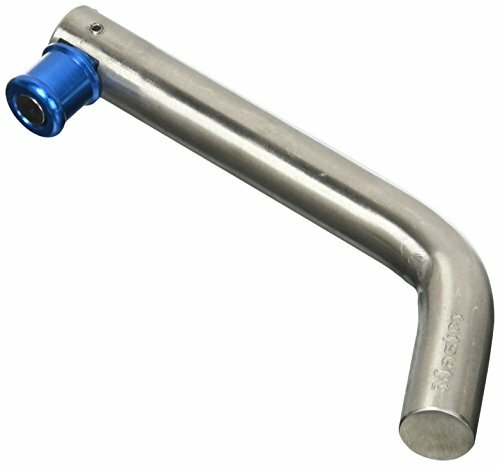 1465DAT features a 5/8" (16mm) Class III/IV stainless steel barrel head hitch pin, made with stainless steel for additional corrosion protection. Tapered ends offer easy insertion. 5/8" Stainless steel pivot-lock hitch pin Stainless steel hitch pin fits 5/8" (16 mm) receivers Usable length of receiver pin is 3" (76 mm) Stainless steel for corrosion resistance Tapered ends for easy insertion Class III/IV rating. Best Used For Automotive and towing Trailers, vans and moving trucks Marine recreation. The WAR-LOK Heavy Duty Puck Lock and Hasp fits your van rear and swing doors. 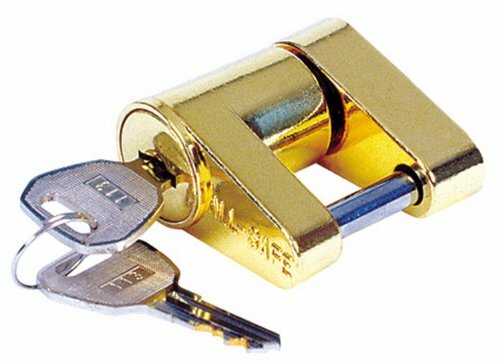 It provides an additional critical layer of security beyond the factory door lock or a single hasp with exposed padlock. Designed to withstand brute force attacks from hammers, cutters, saws and drills. Hardened steel, non-corrosive and weather resistant. Mounting bolts not included. Master key is unavailable on Amazon. Lost keys can be replaced, if registered with manufacturer. Number listed on key tag needed. The C-Lock has an industry-standard 1/2" diameter that's designed to fit almost all Class I, II, III, and IV trailer hitches. Locking down your trailer is as easy as sliding the pin into place; a heavy-duty lock keeps it from accidentally sliding out as well as deterring theft. A protective cap also keeps out water and grime, weatherproofing the locking hitch pin for years of reliable, rust-free use in any environment. Two duplicate keys are included for added convenience. VERSATILE: Built to fit most industry standard 1/2 hitch receiver. * THIS LOCK DOES NOT FIT SOME TOYOTA TRUCKS, PLEASE VERIFY ALL DIMENSIONS BEFORE PURCHASING!! 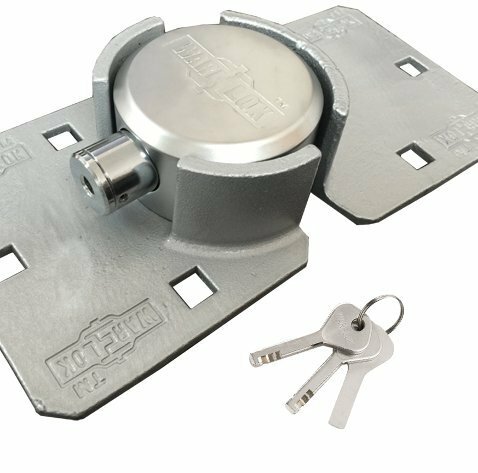 Reese Towpower Trailer Hitch Coupler Lock is designed to provide safety to the trailer from theft. It features a flat key design and is made from brass . Made from machine forged chrome steel, the Trimax T3Black Receiver Lock offers a 5/8" pin with a rugged black epoxy powder coat. The 5/8" pin fits all Class III and IV receiver hitches and prevents false locking-lock can't just pop open. 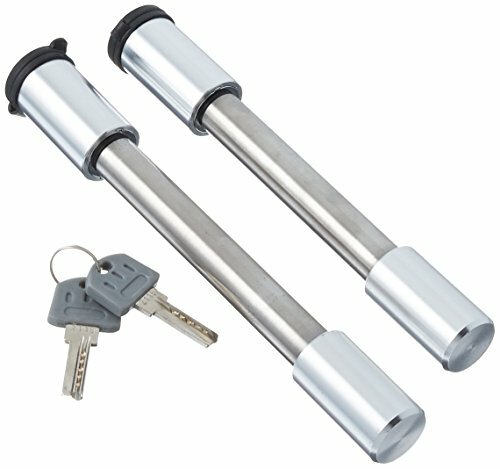 Durable and resilient, a quarter turn of the rugged tube key locks and unlocks the strongest locking pin. Plus, it boasts a water tight cap that seals out dirt and corrosion. Fits a span of 2 3/4". The Master Lock 379ATPY features a universal trailer coupler lock, designed to fit 1-7/8in (48mm), 2in (51mm) and most 2-5/16in (59mm) couplers. The advanced locking mechanism provides resistance to picking and prying. The Limited Lifetime Warranty provides peace of mind from a brand you can trust. * This lock DOES NOT fit CURT channel style adjustable ball mounts 45900, 45901 and 45902; DOES NOT fit CURT channel style adjustable pintle hooks 45907 and 45908. * This lock DOES NOT fit Andersen Rapid Hitch adjustable ball mounts. * This lock DOES NOT fit FASTWAY adjustable ball mounts. Replaces the 3/8" diameter snapper pin for Lippert Components Ground Control 3.0 electric 5th wheel RV leveling system (LC358590). Used to attach the foot pad to jack. 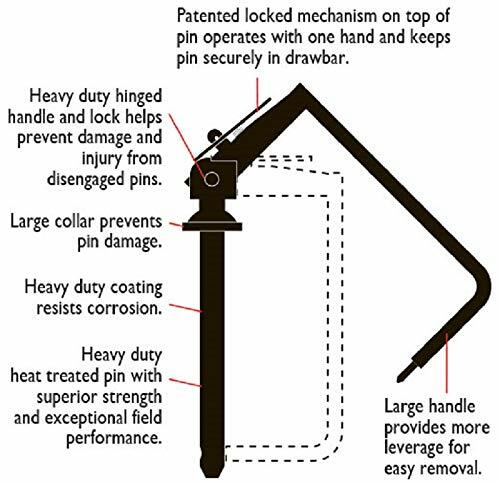 Patented locked mechanism on top of pin operates with one hand and keeps pin securely in drawbar. 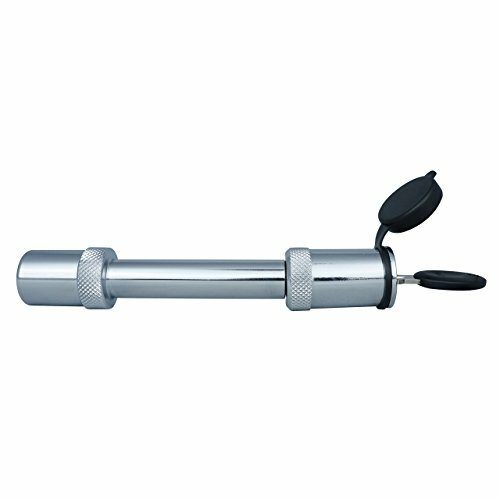 Large handle provides more leverage for easy removal. 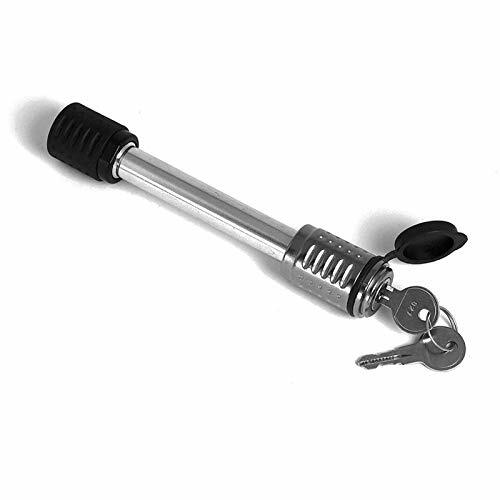 Heavy duty hinged handle and lock helps prevent damage and injury from disengaged pins. Large collar prevents pin damage. Powder coated finish resists corrosion. Heavy-duty, heat-treated pin with superior strength and exceptional field performance. Strong. Simple. Safe. 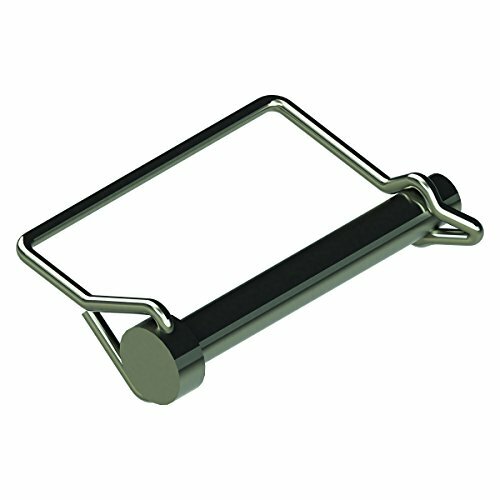 Safety hitch pins feature a patented, heavy-duty hinge handle and lock for increased strength and security. 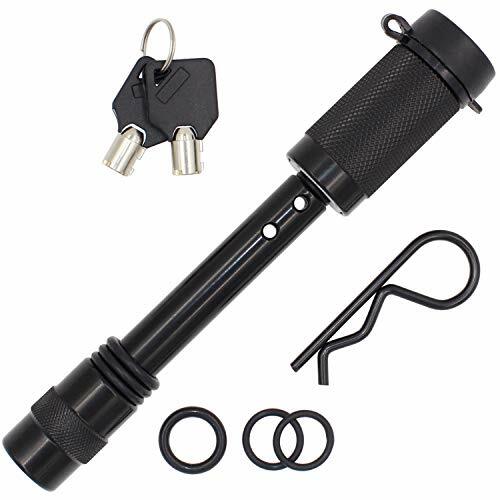 Shaft Diameter: 1" Usable Length: 6"
AC-DK 5/8" Trailer Hitch Pin Lock - Anodized Black Finish with 3 Keys - KEYED Alike! 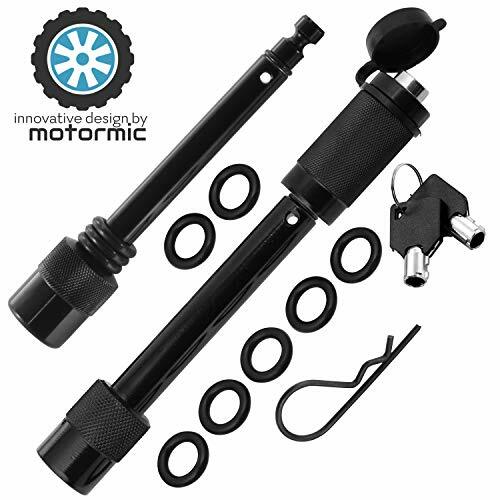 - Adjustable Dimension and fits All 2", 2-3/4", and 3" Hitch Receiver Class I,II,III,IV,V ! KEYED ALIKE: Every lock come with 3 keys and ONE key can open BOTH 1/2'' and 5/8'' lock pin no matter how many you order! NEW DESIGN: 5 pieces rubber "O" rings and 1 piece steel "R" ring for adjusting the dimensions of lock pin to fit 2", 2-3/4" and 3" hitch receiver! GUARANTEE: AC-DK promise what you will received is exactly same as pictured and described! - Fits all 2", 2-3/4" and 3" hitch receiver! We will refund the cost in case of its quality damage during the year. Register your product when you receive it and let us know in case you have a problem. We suggest that you find a professional to install. If there are any problems on the installation, please feel free to consult at any time. NEW DESIGN: 5 pieces rubber ''O'' rings and 1 piece steel R ring for each lock adjusting the dimensions of lock pin to fit 2, 2-3/4 and 3 hitch receiver! SPECIAL MADE: Solid Steel And Anodized Black Finish! Cam-type lock with narrow keepers. All steel 14" handle and hasp allows the builder to weld handle lug to pipe (not included). End brackets are 5-1/8" x 1-5/8" with (2) 9/16" mounting holes spaced 4" apart. Middle brackets are 4" x 1-1/2" with 9/16" holes 2-3/16" apart. Kit requires 3/4" diameter pipe and welding of handle to complete. 3/4" pipe or mounting hardware not included. Cam-type lock with narrow keepers. All steel 14" handle and hasp allows the builder to weld handle lug to pipe (not included). End brackets are 5-1/8 x 1-5/8 with (2) 9/16 mounting holes spaced 4 apart. Middle brackets are 4 x 1-1/2 with 9/16 holes 2-3/16 apart. Kit requires 3/4 diameter pipe and welding of handle to complete. Kit includes keepers, lugs, (4) retainers, handle with bracket and hasp. Installation requires welding handle to pipe. 3/4 pipe not included. Mounting Hardware not included. Assembly can be installed on flush or up to 0.75 inch offset doors. 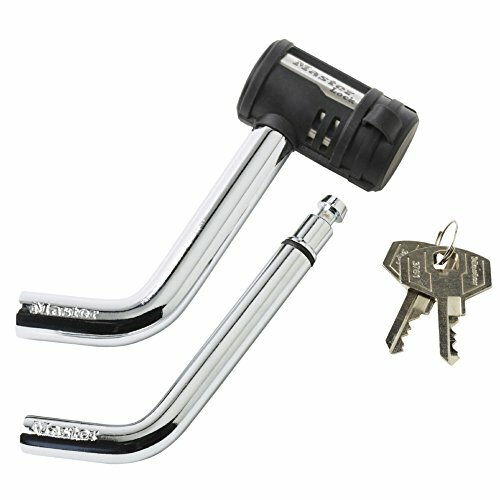 The Heininger Advantage Hitch Lock is the best defense for securing your trailer or bike rack to your hitch. Receiver lock for both 2 x 2 and 2-1/2" x 2-1/2" receivers. Use in place of standard pin and clip to prevent drawbar or accessory (bike rack/cargo carrier) theft. Fits 2 x 2 (Class III and Class IV) and 2-1/2" x 2-1/2" trailer hitches (Class V) or any hitch requiring a 3 span. Pin diameter: 5/8", Inside width: 3-1/16", Overall length: 6-3/8". Pin diameter: 5/8", Inside width: 3-1/16", Overall length: 6-3/8"